Final prototype for the Sweaty Betty fitness App. 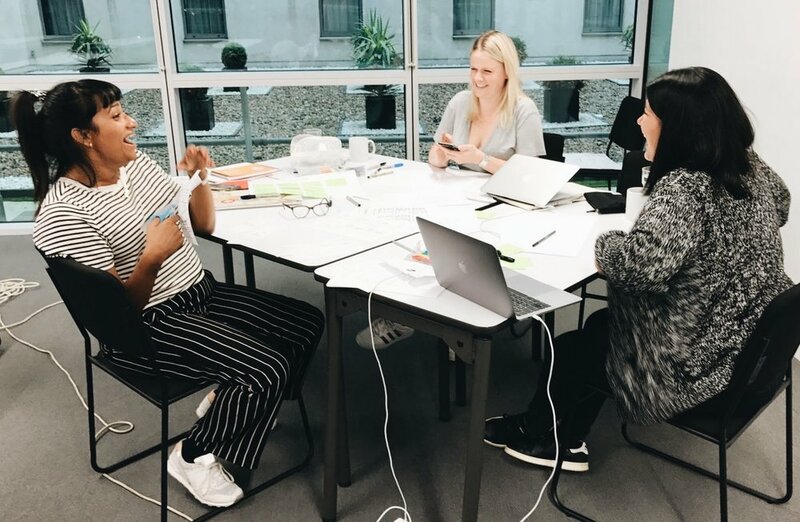 A concept project to design a health app allowing users to book in-store fitness classes, track health data and purchase Sweaty Betty products. As a group, we worked together comprehensively from research and ideation, through to low - mid fidelities. My role included the design of the high fidelity screens and the interactive prototype. To gain an understanding of the brand we began with a review of their website and visited their store on Redchurch Street. We conducted a competitive analysis by visiting alternative retail stores and fitness studios Lululemon and FRAME. Our team began with an analysis of the Sweaty Betty website, we then conducted a site visit to their store on Redchurch Street. As part of a competitive analysis we visited it competitors Lululemon and FRAME in Spitalfields. Sweaty Betty Store, Redchurch Street. 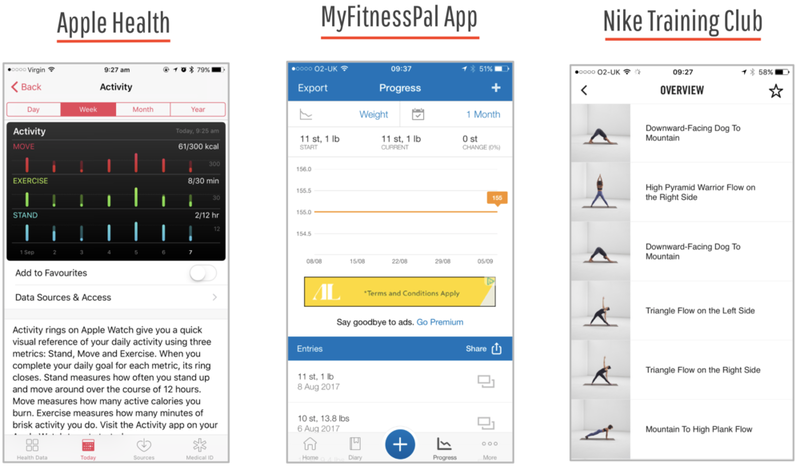 We also compared fitness apps Apple Health, My FitnessPal and Nike Training Club. 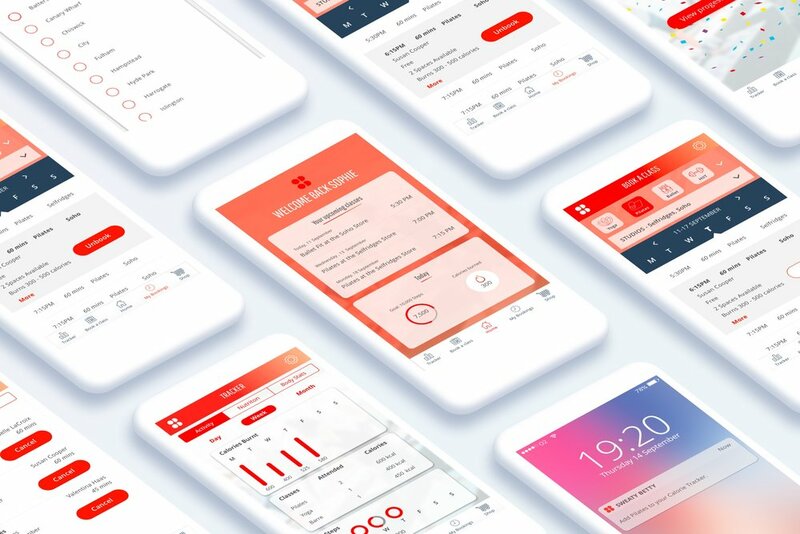 Apple Health: The app is very visual and interactive, the graphs allow the user to easily see their output, set goals and clearly see whether they are on target. MyFitnessPal: Through our screener survey over 64% of those who took part said they use it. Users can input and track a variety of stats including, water, food, exercise and calories burnt. Nike Training Club: Allows users to personalise their training plans based on their needs, with over 100 workouts instructed by Nike Trainers, users can challenge themselves with a variety of new workouts. To distinguish participants for our user interviews we began with a screener survey, we received 47 responses. Through the survey we were able to identify health tracking and fitness habits. I conducted 4 out of the 13 user interviews in which we consulted people who considers themselves to have a healthy lifestyles, which consisted of nutrition and also working out. Tatayana prefers to attends group exercise classes as their short and fun, she workouts for the positive effect it has on her overall well-being. She finds apps tedious and time consuming. Eric's behaviour and habits are dependant on whether he is working towards a marathon or not. He would only consider health tracker if it had no manual entry. Jacqueline needs an occasion to work towards, otherwise she easily loses focus, she finds health and fitness apps to be tricky to use. With the responses and key quotes from the 13 user interviews we created an affinity map. 1. Things that get in the way of a healthy lifestyle. Tedious data inputting of nutritional information. 2. Physical and Emotional reaction health and fitness. 3. Tracking of health and nutrition data. All users tracked their progress to some degree; whether it was recording their nutritional intakes and workouts into a spreadsheet or noticing how their clothes fit. Some users were unable to be spontaneous with the classes they attended and the complete booking procedure had too many screens. Defining key themes from the affinity map. We created two proto-personas, based on themes from the affinity map. Sophie was focused on fitness and nutrition for the benefit of her overall well-being. Jenny was goal orientated she would lose focus when she doesn’t have anything to work towards, both of them encountered frustrations with inputting data into fitness apps. Moving into design studio we chose Sophie as our primary persona and created scenarios based on findings from our user responses in our affinity map. From our user research it was important that the app was simple and easy for the user to track their fitness data. Simplicity: Designing a simple booking and tracking process without the tedious data inputting. Personalised: By tailored functions to the users interests and preferences. Companionship: Guiding the user through their journey to health and wellbeing. To generate many ideas quickly as a team we ran a design studio. Through critique, iteration and ideation we were able to refine our scenario. We created a user flow and a wireframe based on our core user journey for the scenario. "Sophie wants to book Thursday’s Sweaty Betty Pilates class in Soho or Selfridges and track her calories burnt immediately after her workout." Through user testing of the paper prototype we noticed that users were confused with the language we used. We also discovered that the map view was not ideal for users to identify which studio they wanted to attend. Instead, we opted for a list of studios. Through a testing shuffle we carried out a further 12 user tests of the mid-fidelity prototype. With the 'Home' screen below, through testing we found that preferred to have an over view of their health and fitness stats. Informing them how close they are to reaching their 'weekly step target' and listing their 'upcoming classes'. Through testing we discovered that users wanted clearer titles for each sestion and measurement units included. 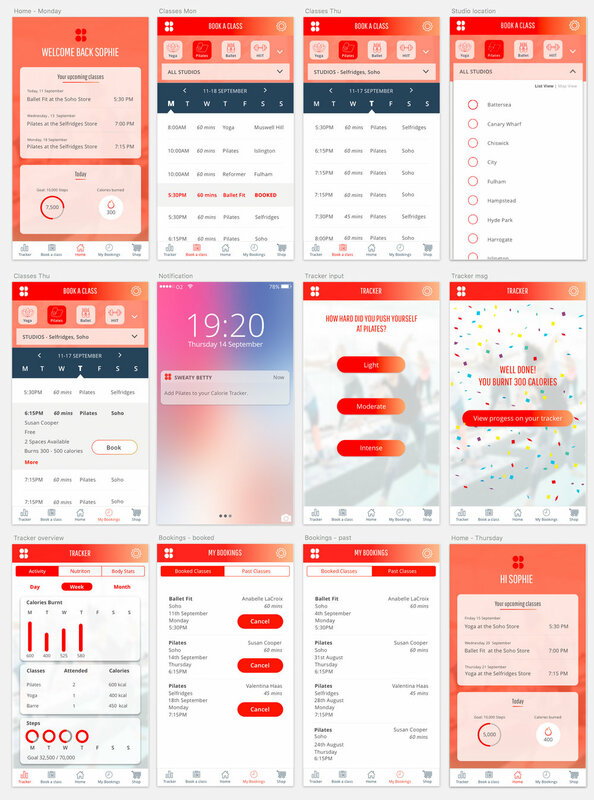 The further iterations we made were to the global navigation, we changed the to the icons based on user feedback and button sizes so that they were in-keeping with accessibility standards. Taking colour inspiration from the Sweaty Betty website and store I put together the colour palette and style guide. I noticed their palette was mainly black and white with an accent of bright orange. In keeping with their aesthetics we carried this throughout our design high fidelity design. Using the inspect tool we identified the font used on the Sweaty Betty website. We also kept the iconography uniform as well so that it was in-keeping with their aesthetics we carried this throughout our design high fidelity design. I worked on the high fidelity screens, specifically I designed the Book A Class, Notification, Tracker Info and Tracker Overview Screens. The mid fidelity prototype was tested further by 12 users. We presentated our finding and our interactive prototype to to our UXDi class at General Assembly. The scenario: Sophie wants to book this Thursday’s Pilates class in the app and remember to track her calories burnt immediately after her workout. Equipment free workout videos which users can follow along, at home or outside. In the 'Tracker' overview we would break down the 'calories burnt' graph so that it references how they burnt their calories and through what exercise type.